Last Friday represented the anniversary of a significant and sad day in commercial radio history. November 23 was 20 years to the day since Fox FM’s Martin Molloy decided to throw in the towel, after four hugely successful years as Australia’s first ever National Drive show. 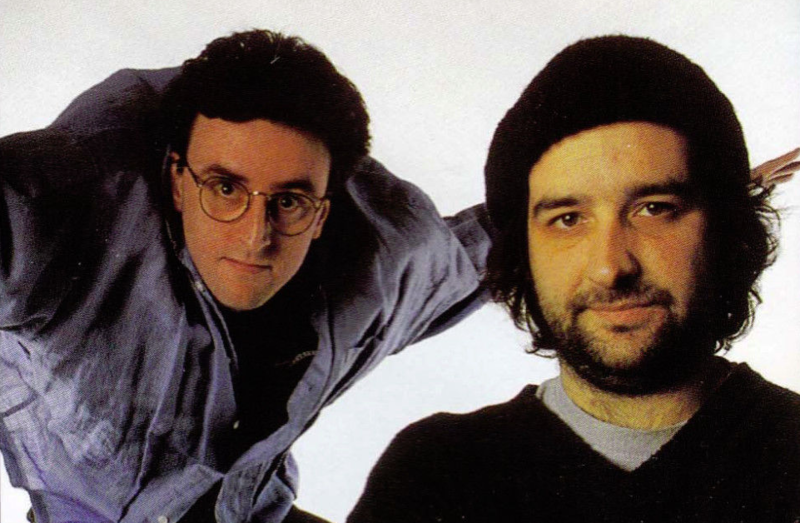 Tony Martin and Mick Molloy’s groundbreaking show broadcast for four years – from 1995-1998 – and its final airing took place on December 4. Martin Molloy was a certified game changer – networked into every capital city as well as 47 regional stations – that paved the way for the likes of Hamish & Andy, Kate Tim & Marty, Kennedy Molloy, Hughesy & Kate and many more. In light of the show’s anniversary, it seemed like a good time to catch up with one-half of the duo, the incomparable Tony Martin, for a two-part interview that starts right at the beginning and follows the journey of Martin Molloy right through to the end (with the odd pit-stop for an anecdote or two). Let’s start from the beginning. Where did the idea first come from that you and Mick would make a good duo? That was interesting because we came up with it. I had seen Mick on the stage. I was in The D Generation in the 80s. They were from the Melbourne Uni Review, I was the only one that wasn’t. We would have to go and see the new Uni Review every year and sit in the Royal Box. In 1987 when Mick Molloy was in it, he was like the stand out person in the show I thought. He worked as a writer on our D Generation specials in 1988. Him and Jason Stephens. The producer hated them for some reason because the producer wanted to install his own writers, so he was really horrible to them. We didn’t work together after. I thought, “Well, that’s the end of working with Mick and Jason.” Then they went off to work on the Comedy Company and had an even worse time doing that. Then we ended up working together again in 1990 and it really only happened because we were doing The D Generation Breakfast Show and we wanted to do pilots for the Late Show at Channel Nine. Even though it ended up on the ABC, we did five pilots for it at Channel Nine. We were gonna do the pilots and the radio show at the same time. We needed to get a couple more people on board, so we got Mick and Jason to come back and join the team, now that the horrible producer had gone. They joined our radio show and also worked on the TV pilot. On the pilot, we did a segment called ‘Pets in Peril’, where we would threaten to kill an animal unless somebody claimed it. We would have a dog from a rescue home on a giant log going along on a conveyor belt towards a buzz saw. People had to call in and save the dog before it got sawed in half. That was the idea. If the show had gone to air, we would have done one of those every week. We never ended up doing that segment on the actual Late Show on the ABC. But me and Mick, I think we might have thought of that idea, so we were chosen to host it. That was really the first thing we did together. It was just a really good combination, so that’s how that long-winded story is how we became a team. Then later, we were both working on the EON FM Breakfast Show. About halfway through 1990, we started doing a Sunday night show as well, called ‘Bulltwang’, where we could do much longer segments because on the Breakfast show everything had to be really short. Whereas on Sunday nights you could do a seven or eight-minute segment. Me and Mick did that for… it was only on for four months, but it got a huge following. It won an award at the rAWARDS, which are now the ACRAs. That was in 1990, but that kind of served as a pilot for Marting Molloy, in a way. Martin Molloy was very similar to ‘Bulltwang’. It even had Pete Smith as the announcer. Then we went off and did the Late Show. Then after the Late Show, we toured around for a year. The other people from the Late Show went and became Working Dog. Me and Mick tried to get up our own TV show called Martin Molloy, and that didn’t work. Then we tried to go back to radio. I can never remember when Triple M and Fox became part of the same network under SCA. I remember us pitching Martin Molloy to Triple M, to the people who made our D Gen Breakfast show, and they said no. That was the first place the show was pitched to, is that right? Yeah, and then somewhere around there, Brad March got wind of what we wanted to do and he said, “Yeah, let’s do it.” We ended up doing it on Fox. To this day… in people’s memories, people think Martin Molloy was on Triple M.
I’ve even had the chairman of Austereo – when we were doing Get This – say to me, “I always said you and Mick were the heart and soul of Triple M.” I had to remind him that we weren’t on Triple M.
Brad was really the one who saved the show in a way because I was about a month away from moving back to New Zealand. We were just getting nowhere with the idea of Martin Molloy. That’s how it ended up on Fox, or 2Day. The Today Network. What sort of feedback were you given when you pitched it to Triple M and they decided not to take you up on it? I really can’t remember because we were really riding high at that point. The Late Show had been a hit and we’d won both the Comedy Logies. Me and Mick had spent all of 1994 on this endless national tour, playing to a thousand people every night, so we were quite successful. Also ‘Bulltwang’ had kind of shown people what the show would sound like. It must have been some station politics. You know what it probably was… It was because we were pitching it as a Drive show. Right, because there hadn’t been a personality-driven Drive show before? I’m assuming Triple M just couldn’t see it working as a Drive show, but I’m really not sure. Were you surprised at how quickly both of you were resonating with audiences and how little time it took for the show to become a success? Yeah, because it was all around the country. Even Brisbane. Places like Brisbane can be very suspicious of a show from down south. Yet it caught on there really quickly. I think maybe it was just because people knew us from TV. Also, the Late Show had ended when it was at its height of success. It was like it only lasted two years. I think people just wanted more of me and Mick We just had a lot of things, luck in our favour because the show rated really quickly. I remember at the time thinking, “Wow, if we hadn’t rated really quickly, we probably would have been told to tone it down.” It was really comedy intense. We had no interested in doing anything but comedy. Even if we got a guest in, we were constantly — I think probably to Brad’s frustration — turning down big-name guests, in favour of people who we could pissffartaround with a bit more. We would have someone like Dave Graney on all the time, who was quite big at that time, but who wasn’t your classic Austereo artist. Dave was really funny. We tried to always have… even if we had musicians on… we would have people like Dave Graney or Tim Rogers. We tried to always have people who were either were funny or could go along with the jokes. It was really just for the solicit. Then the solicit, the first part of it, we would do a bunch of jokes on that topic. Then we would go, “Now let’s see if the caller’s got a story like that.” Often one of the callers would be a fake caller or would be one of our characters from the show. Even the phone in was just to try and get us to more comedy. There was never anything serious… if there was something serious on the news… I don’t know Anzac Day, or Princess Diana got killed, we just wouldn’t touch it, because we just wanted everything to be funny. There was never a bit where the show went serious. Stay tuned to Radio Today next week for Part Two of our chat with Tony Martin. Kennedy Molloy could learn from that last point. Often a serious topic is raised and Mick will joke about it. Kennedy Molloy could learn A LOT from Tony. Tony should write a biography or someone should write one for him. Who at Triple M turned down Martin Molloy ? Its like turning down The Beatles. @ian check out ‘Lolly Scramble’ and ‘A Nest of Occasionals’. Great stories from Tony’s life. Who was the Triple M CD or Group CD in 94/95 who Tony was polite enough not to mention ? Anyone know ? is that the Beanie Craig Bruce is wearing around tone has on?